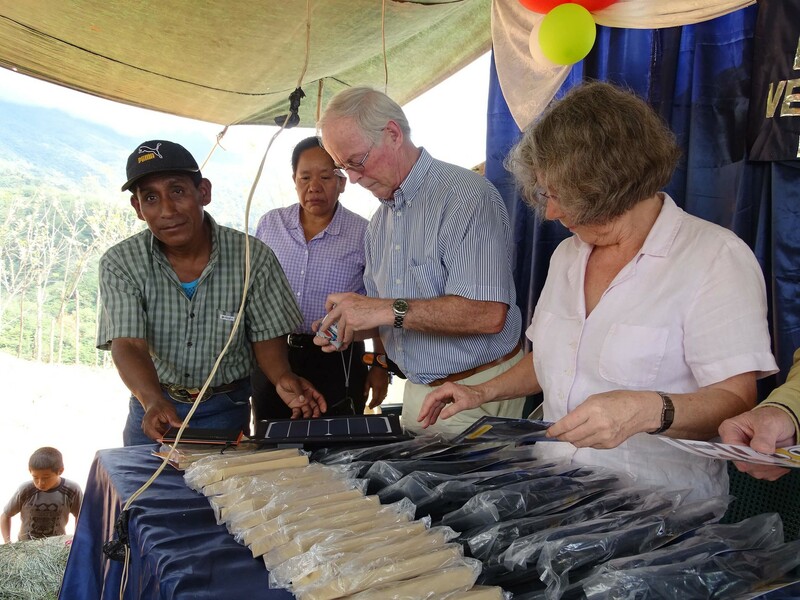 Mobisun in Se’Balam to deliver solar panels and power banks to 21 families. 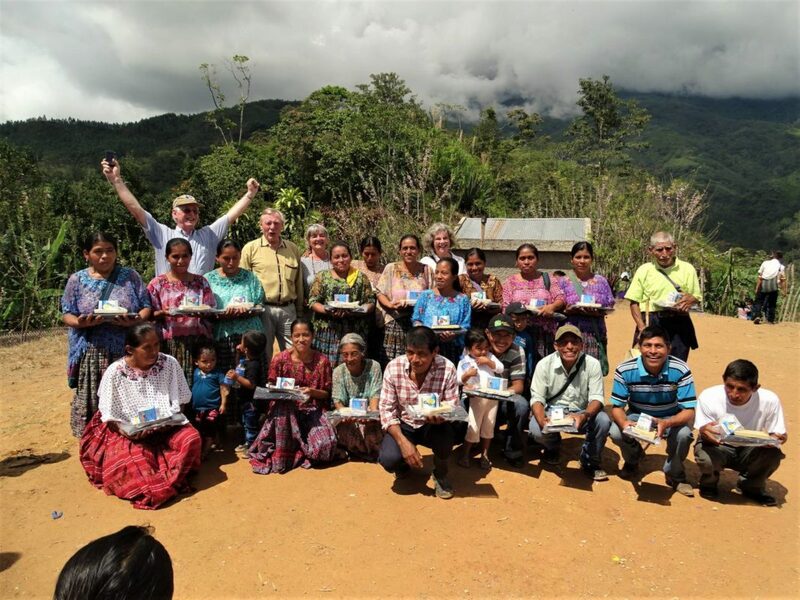 Today, the 6th of February, 21 families are expecting us in Se’Balam because they have saved money to buy our Mobisun power banks, solar panels and USB LED lights. Each portable solar panel, power bank and USB LED light saves a lot of money them each month. They can charge their batteries and add light to their homes when the sun is down. The power banks, portable solar panels and LED lights are life changing for them and so was the welcome they gave us. In the morning we had breakfast at our trusted spot in La Tinta. This time Mario Rolando and Samuel were also part of the group. I choose for the pancakes with fruit and honey, absolutely delicious, and we were ready to go! The bumby way up the mountain was full of ditches, big rocks and mud that we had to drive through. Despite the hard road the view over the valley was fabulous. This was the perfect location to film another episode of a TV show with the most dangerous roads in the world. Especially when an oncoming car was approching you couldn’t go anywhere. The cliffs were so deep that one drop down would end your life for sure. Sometimes a bus full of Maya’s tried to pass on the narrow road. The road was extremely dangerous. After a long trip we finally made it to Se’Balam and the locals gave us a warm welcome with songs and dances. The moment of joy did not last very long because one of our four wheel drives had problems with the slippery road and the locals needed to help us push the car. Finally the car was safe and the heavy job was successfully completed thanks to the joined effort of the people. Not very long after the sweaty and hot job other people from the village arrived with trumpets, drums and flags to welcome us. A once in a lifetime experience (we think). We thought we had seen everything but when we arrived in the village, to hand over the Mobisun solar panels and power banks, we were welcomed once again like never before. The locals made a little stage for us where we handed over the Mobisun portable solar panels and power banks and the locals were very happy with their life changing equipment. 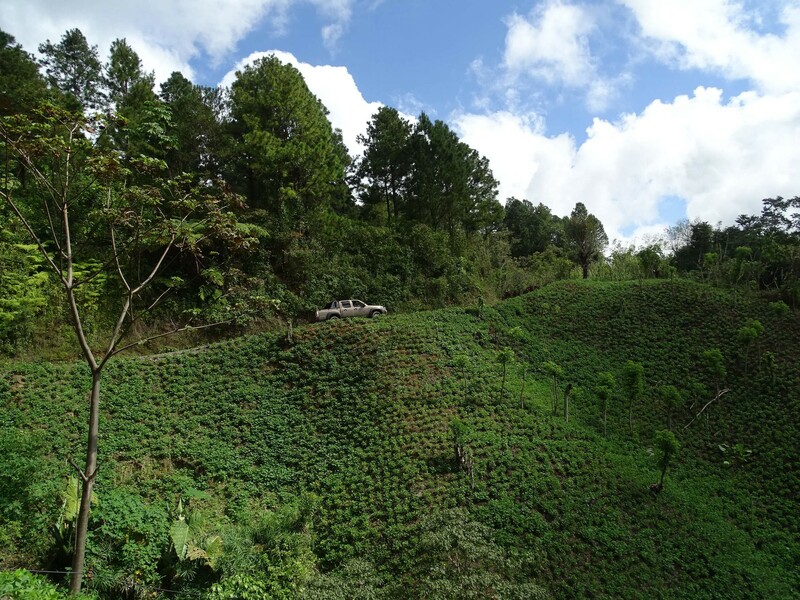 Se’Balam is my favorite place and the way up there is so beautiful. The people are so generous and happy with every little thing they could get from the outer world. The welcome, happy songs and beautiful dances the people gave us every day to enjoy were absolutely fantastic. 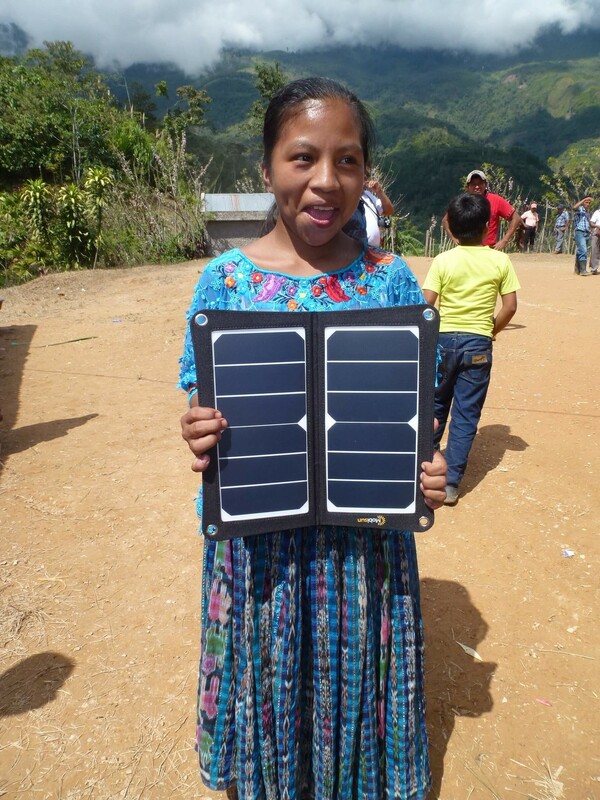 The local people of Se’Balam were so happy with the Mobisun power banks and portable solar panels. I have never seen such happiness before! The moment we were going to hand over the Mobisun power banks and solar panels was very exciting and emotional as well. The Mobisun package was delevered to the locals a price of 250q and that is as much as € 27. This is a lot for these people to spend and it is very hard for them to save this amount of money. One of the locals, Juan Tzub, already owned a Mobisun package for the last half year to test if he could save money with it. He says that the Mobisun power bank, portable solar panel and USB LED light earned his savings of 250q back in just a few months and he could save more money in the future because he is able to save on candles and electricity in a nearby village for his mobile phone. After we handed over the Mobisun package we mentioned that people who didn’t order the Mobisuns could backorder it at Mario Rolando. He gave us a list of 14 names that would already like to receive the Mobisun package. Now we are investigating if it is possible to ship the Mobisuns to Se’Balam from the Netherlands. During the handover Jan explained how the Mobisun power banks and portable solar panels work, how the people are able to connect both products as well as the LED lights by USB and how to charge their batteries with the Mobisun package. The locals looked at us if we were angels and that gave us a satisfying feeling that I will never forget. After another long, beautiful day in the sun we ate the best meal I had in a very long time. The macaroni, beef and beans tasted so good that this was the perfect end of our trip to Se’Balam. But we had one more present for the kids before we were going home. We gave all the kids a hand full of candy that they didn’t expect and those happy little faces satisfied me even more. It looked like these kids had the time of their lives with just some candy. It was a phenomenal trip!